If you have not watched the actual show and you planned on watching the recap instead, please don't do that. The recap is helpful, but the show is really good and fun to watch. This is episode 10.5. I recommend watching the recap after catching up to episode 10. This recap pretty much reminds us of each little detail we need to know. For people that are very lost in the plot of the series, but are still enjoying the show, I recommend that you check this recap out. Not only does it remind you everything you need to know for the next two episodes, but it tells it in a very funny and enjoyable way. The soundtrack is a big plus in this recap, too. If you like the music in the show, you'll love it here, it's great. If you are very aware of what is going on in the show, you won't be missing out from much if you skip this, but if you like/love the show, watch it. It's more of what you love. 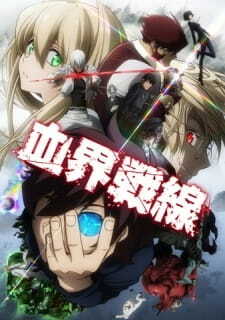 Overall, it's a fun recap, I liked it and I recommend you actually watch it to get ready for more Kekkai Sensen!